1. Using your scissors and/or paper punches, create several sizes and shapes of small paper pieces. Using your hole punch, create a place in each piece for a ribbon or string to go through for hanging. Handy Dandy Tip: Do not limit yourself to simple circles or squares. You can cut any shape that you'd like as long as it is fairly easy to do and is large enough for your stamp size. Also, not all of your tags have to be the same shape. Don't be afraid to experiment to find out what looks best for your purpose. 2. If necessary, temporarily adhere your unmounted rubber stamp to the acrylic block. (I use a little double-sided tape for this.) Apply a liberal amount of ink to your rubber stamp using your ink stamping pad. (You may want to test the ink color and consistency before applying it to your final tag paper.) When the stamp is inked well, decorate your paper tags one at a time - re-ink your stamp between each stamping. If your ink pad brand is not fast drying, allow the ink to dry for a while before moving to step three. Handy Dandy Tip: Not all images have to be symmetrical on your paper tag area, nor do they have to cover the entire tag. 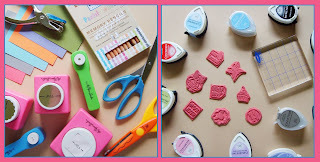 Have fun with your stamping! Experiment with placing the image off-center or letting it bleed of the edge of the paper. 3. Once the ink is dried, you can embellish your tags further. Add ribbon, thread, or string. Use colored pencils or markers to color the stamp images and customize each tag. Handy Dandy Tip: You can use your stamping pad to create a colored edge around your tag by easily going along the edge of the paper. It creates a nice outline effect. These are just a few of the hang tags that I came up with in one hour during a leisurely weekday afternoon. If you are making hang tags for a show or special event, I recommend sketching out some ideas of what you'd like first to get organized and be consistent in your tag style. I also recommend making up several (50 - 100) at once to save you time later on. And, remember that it is okay to have some "Oops!" tags - just save them for later. You never know when you might need a little tag for something here and there. All of the stamp designs shown above can be found in my Etsy Stamp & Paper Shop as well as my ArtFire Shop. I have close to 70 stamp designs available with many of them being specifically designed for creating tags and labels. I also carry wooden block mounting kits and a limited line of hang tags and note cards if you aren't the do-it-yourself type. I love your blog & have awarded your blog with a Sunshine Award, which is for blogs that inspire positivity and creativity.